While the effect is rich and striking, etched glass is difficult and costly to install and maintain. Altering etched glass when your tastes change is virtually impossible. And cleaning it can be problematic. By contrast, professionally installed CB Tint glass enhancement window films can replicate the look and feel of etched glass at a fraction of the price, and can be wiped clean with conventional glass cleaners. LLumar iLLusions decorative window films are also easy to change, allowing you to update your look without replacing your windows or fixtures. It’s perfect for both new or retrofit home design projects. Films are available in a range of 50 finishes, patterns and colors – offering stylish, effective privacy without sacrificing natural light – or your budget. 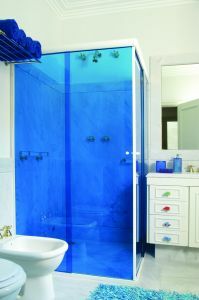 They’re ideal for shower enclosures, glass cabinet doors, glass tabletops and exterior windows. Add a pop of color, enhance an architectural feature or hide an unattractive area – the options for decorative window films are endless! View all of our decorative window film options with this LLumar Window Film Viewer or contact CB Tint in Campbell today to transform your San Francisco Bay area home with iLLusions decorative window tinting.